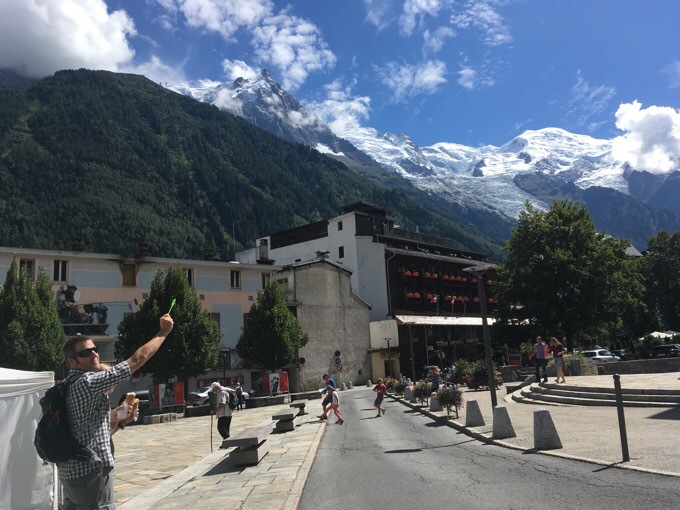 Today was was the big day I got to see Mt Blanc, go to Chamonix, and meet up with my friends I planned to spend two days with. I was nice and cozy last night, but there was a ton of condensation, which was to be expected in this particularly marshy valley. 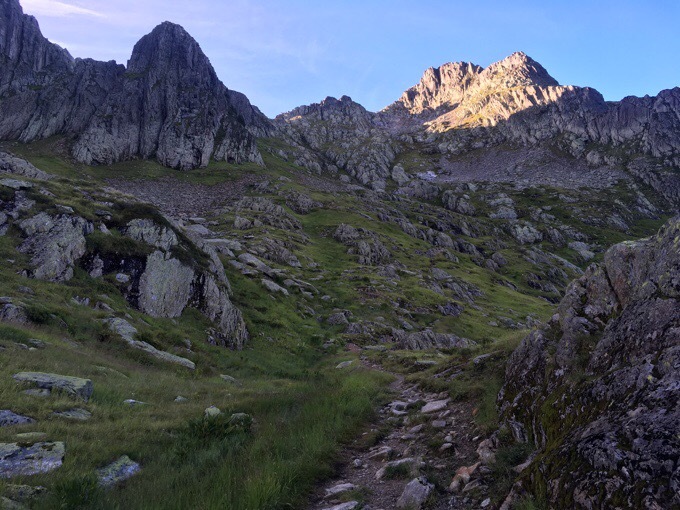 I was up and out at 7am to hike the couple hours up switchbacks to Col du Brévent and then Le Brévent. It was cool to gradually climb up and be able to look back on the valley that I came down last night. 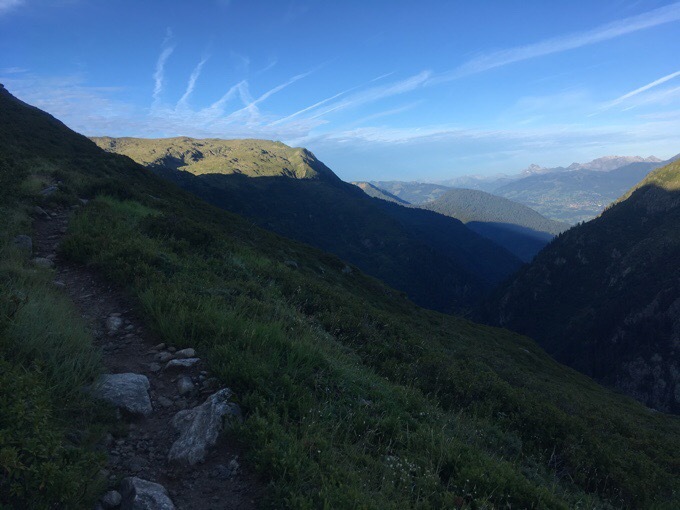 I was up there at the end of the day yesterday and slept in the valley below. 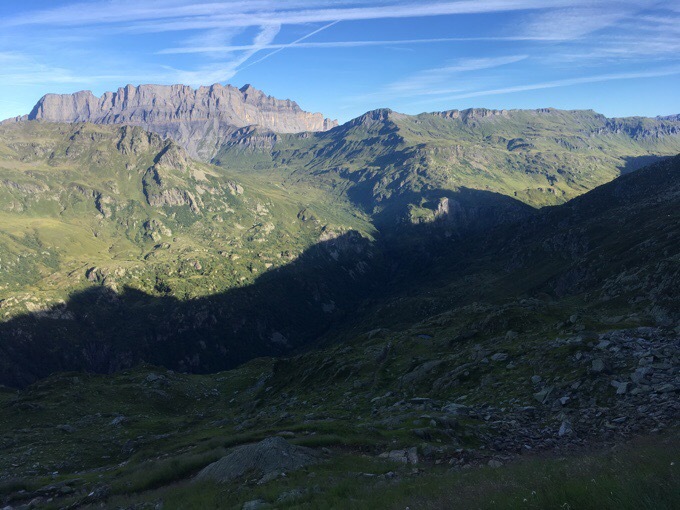 I have purposely tried not to see many photos of what’s to come, and was completely surprised by the view at Col du Brévent. Here it comes! 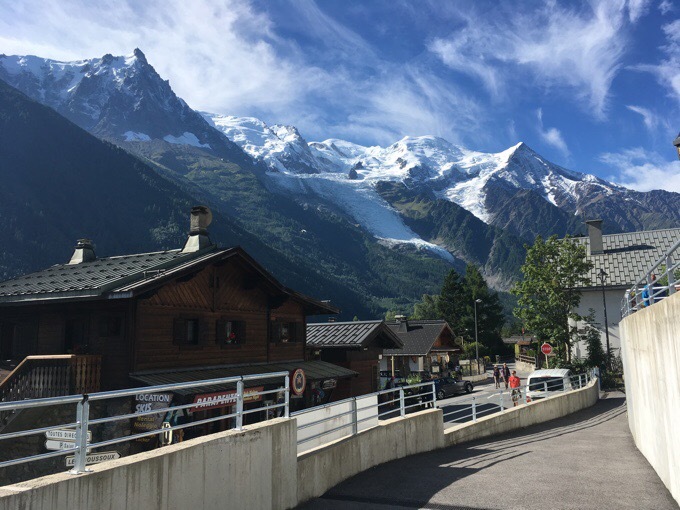 My first sight of Mt Blanc! It was a perfect day to be up there! Since it was morning, I had this very popular spot all to myself. I can’t even begin to tell you how special and unique this was to have it all come together so amazingly well. The universe was in my favor today for sure! Two guys came up briefly and I was even able to get a photo. The high point is Mt Blanc! View at Col du Brévent looking back to where I came from. Even more of the view. I had just 40mins more to hike up to the cable car at Le Brévent. 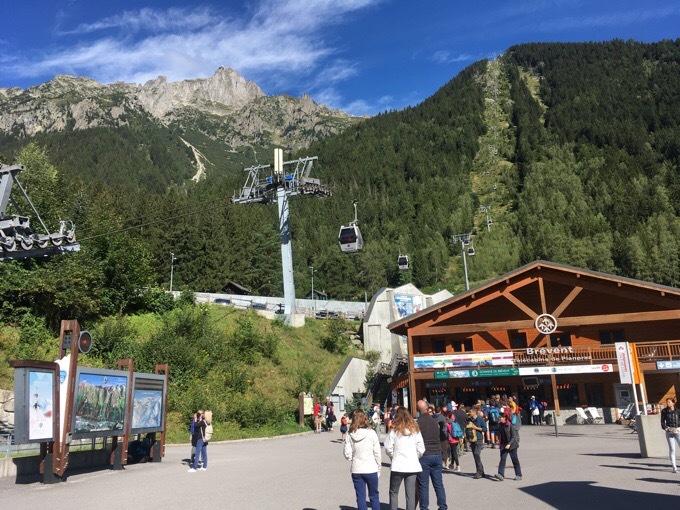 It goes down to a gondola that takes people to Chamonix. 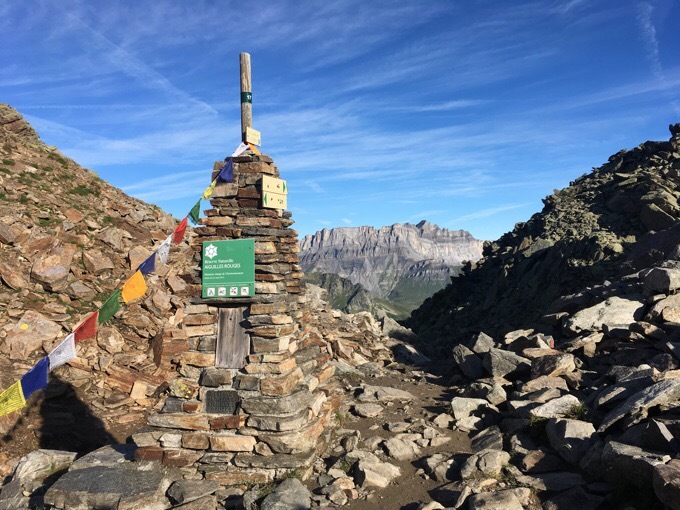 The GR5 doesn’t go through Chamonix, but it’s a can’t miss side trip. Le Brevent is the rock on the right and you can see the cable car heading down. I was there so early that I got the big cable car all to myself, and the woman controlling it was nice enough to take my photo. Looking down on Chamonix from inside the cable car. I just couldn’t believe the grandeur of the view and how incredible the day was. In the summer, the mountain can often be clouded over, so this was quite fortunate that I was getting such a treat. 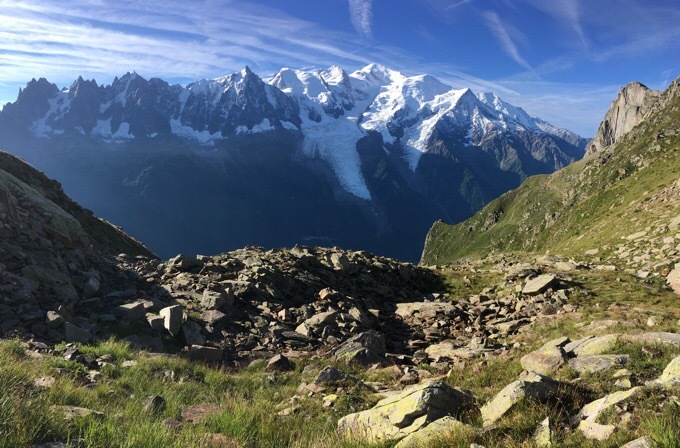 Hey, if I needed to start my hike off with three days of fog to earn this day of clear skies over Mt Blanc, I’ll take it! View halfway down transitioning to the gondola. At the bottom looking at the way up to Le Brévent, the cliff at the top. I walked through town to the hostel I’ll be at the next two nights. It was so surreal to be here and to have the mountains all around looming high above me everywhere I looked. The hostel, Gite Le Chamoniard Volant is a great deal, and actually let me check in just after 10am. I was able to shower, get laundry done (in the sink), and get yesterday’s blog posted just in time for my friends’ arrival at 12:30pm. My friends are the awesome Gian and Laura who overlapped with E and I when we did the Great Divide Trail in 2015! 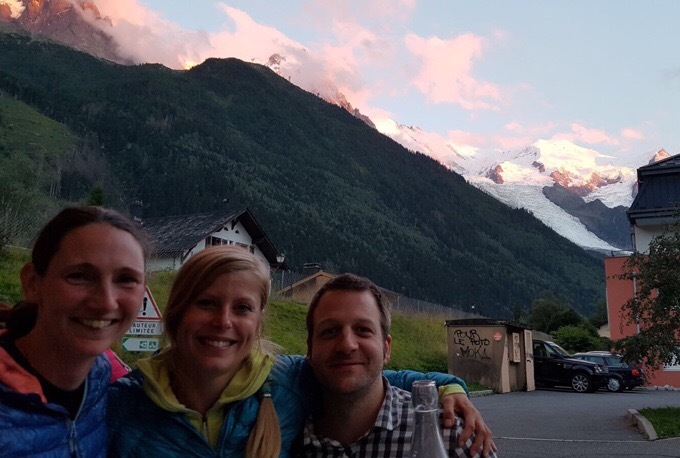 Gian and Laura live in Switzerland and I’m so happy that it worked out that we could spend some time together in Chamonix. 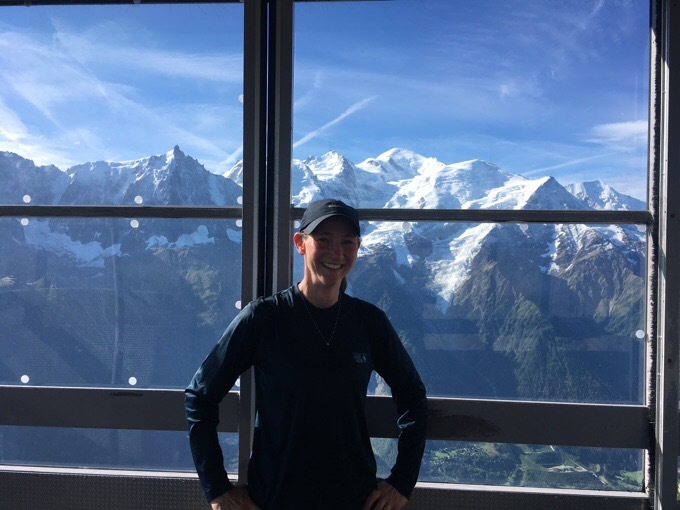 Laura and Gian have done a ton of hiking in Europe, and I credit them for helping me to finalize my choices for this summer and future summers to come. They’ve been amazingly helpful resources, and just did the GR5 in 2014. 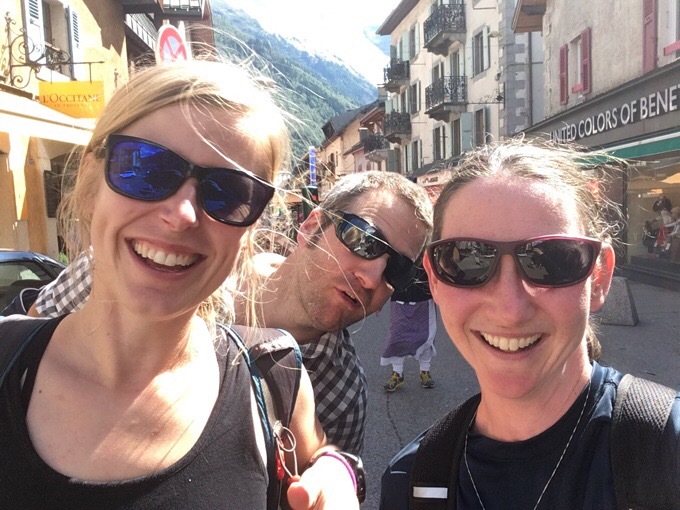 It was a fun and relaxing day spent today EATING and walking around Chamonix. I even got an affordable pair of sunglasses that are rose colored, but the best price I could find for something I refuse to pay a lot for since I lose or break sunglasses so often. I’ll also mention that my eye that’s been irritated started off not great this morning, but improved and is almost back to normal thankfully. 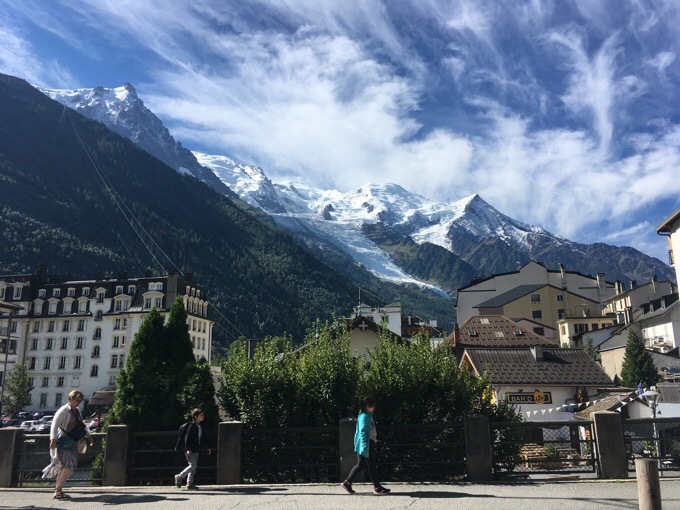 Tomorrow, we will be doing some sightseeing and hope to take the cable car that goes up to L’Aiguille du Midi, on the side of Mt Blanc, and do some day hiking. It goes 3379ft/1030m-12605ft/3842m, and is so popular that we are getting up super early tomorrow to hopefully get a spot to go up. If we don’t, there are other options up that way nearby as a fallback. The cable car to L’Aiguille du Midi goes to that point. It’s late and I’m getting far too little sleep tonight, but it’s totally worth it. Hoping for another great day tomorrow. Possible clouds and a low chance of light rain at some point tomorrow, but it could make for some grand scenery! Dinner with pink alpenglow over the mountains. 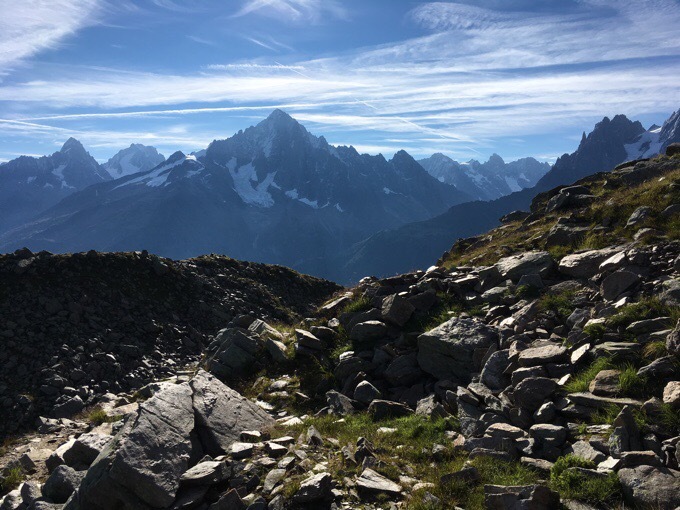 Chamonix is in a lovely spot, no doubt about it. 3842m is about as high as you can get in Europe without proper snow gear, thanks to the cable car .. if you are going to walk around up there take crampons, and dress warm Erin! The beauty is insane! What a place! 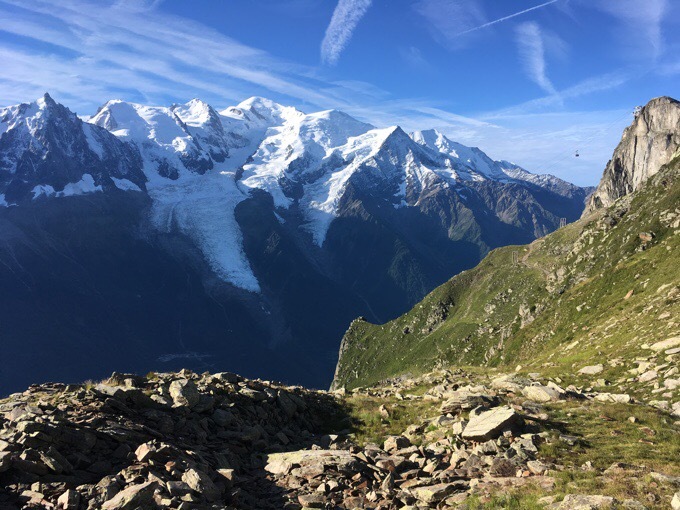 So wonderful to see you there – I did the Tour Mt Blanc a couple of years ago and your excitement seeing Mt Blanc reminded me of my excitement. Enjoy the town time! Crazy Beautiful!! Nice to reconnect. 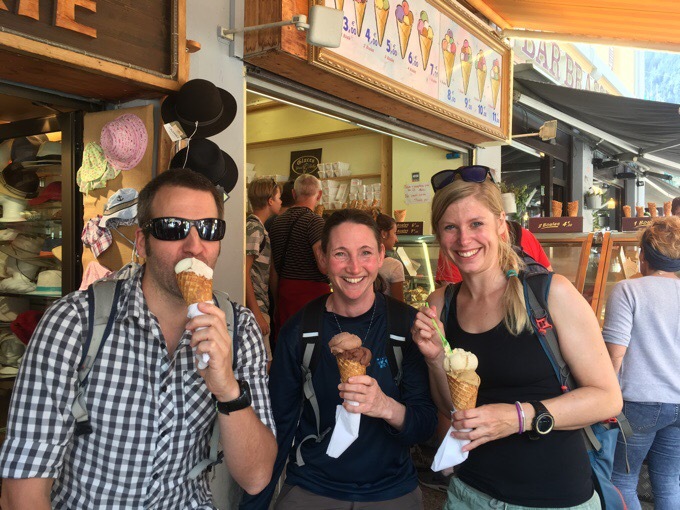 Ice cream ?, New sunglasses ?, and friends.. Enjoy! 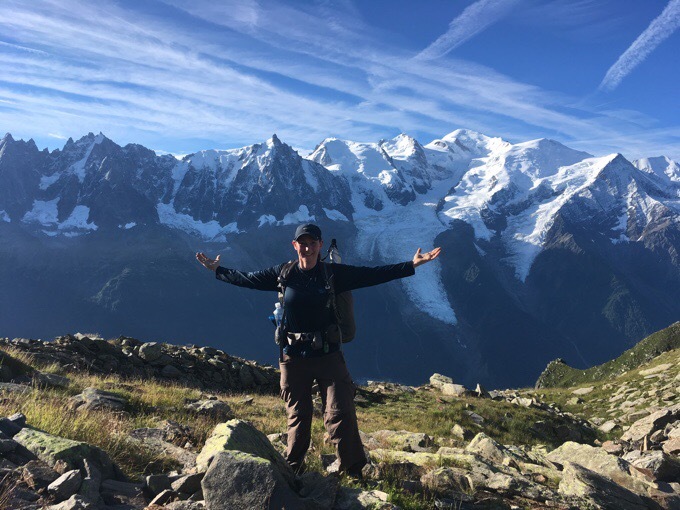 Mr Bland is most likely an overly chill, laid back hiker, last seen on Mt Blanc. Just happy I am not the only one with overly bossy autocorrect! 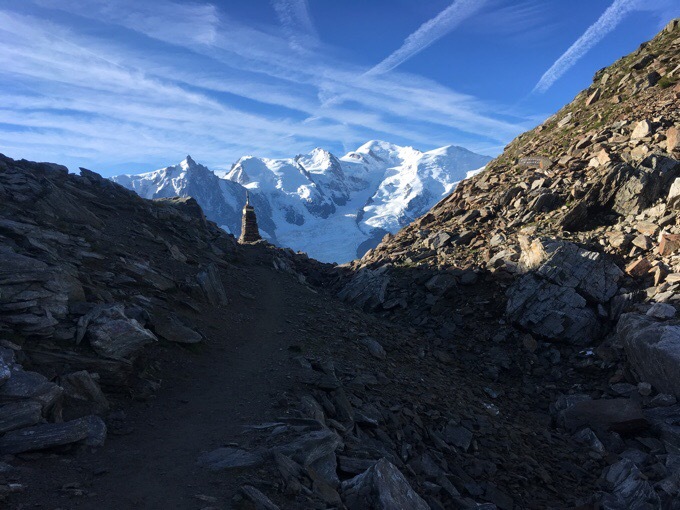 For a great Mt Blanc experience I suggest doing the Mt Blanc circuit of 100 + miles. Passes thru 3 countries. Yup, much of what I’m doing will overlap half of the TMB. It’s on the list for another year as I don’t think I’ll fit in the other half before I leave. Stunning country! Don’t get whiplash with all that beauty. Hope you have great fun with Gian and Laura; so cool that you could meet up with them. 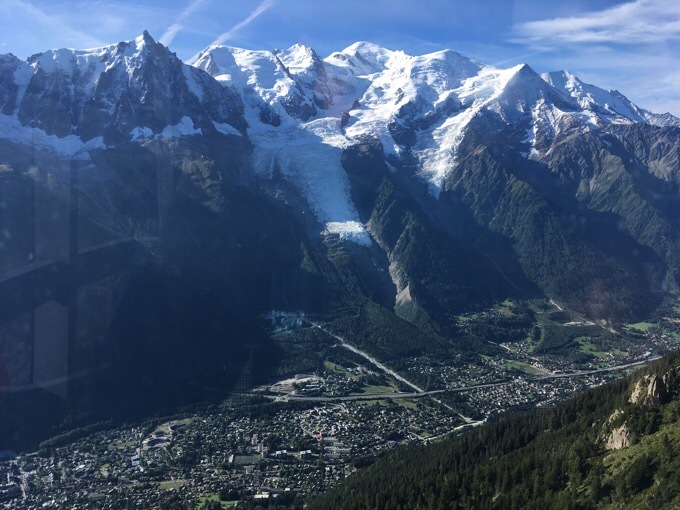 I knew Chamonix looked familiar.. Amazing Race season 28. I think Griggs would love all the extreme options! I am sure you are just soaking up all the extreme beauty. Oh fun! I used to watch that all the time!